I followed tutorials on many websites but most of them were outdated and so lead to errors and other issues. After spending hours, I found this one tutorial that was much recent as compared to others but lengthy as hell. Following the steps provided there, I was able to send and receive email from a nice and simple to use web interface. Here I am writing those steps without unnecessary discussion about each and every step, the problems I faced and how I managed to fix those problems. You cannot create, delete or modify email accounts directly from the final interface you will get. All the mail accounts map to local user accounts on the underlying Linux system. Passwords of accounts cannot be changed for the same reason. It has to be manually changed from console or using some postfix plugins. The web interface you will get is not stylish yet pretty simple and straight forward. Don’t expect a fancy looking user interface like Hotmail or Gmail. Although we will be running everything with limited permissions yet there are some security problems with this setup e.g; MITM attacks. If you are OK with these limitations you can go ahead otherwise go for alternate solutions that I have mentioned above. If you don’t know basic Linux terminologies or the basic commands used in Linux you might feel lost. If that’s the case, seek help from a Linux pro. Most VPS and dedicated server providers allot Static IPs. In case you don’t have one or you are setting up on your home server, this simply wont work for you. You must have SSH access to your server using PuTTy or other means. This is a must so that so can run commands on your server. This tutorial assumes that you are the administrator of this server. So you must have root access on your server in order to install anything at all. Before you start, make sure you have logged in to SSH and changed to root. Your server’s hostname or FQDN should be the same as your mail address domain name. If you are going for admin@mydomain.com, your hostname should be mydomain.com. To know your current hostname, type hostname in SSH. Your servers’s Public IP address should point to your FQDN. This is not set by default. It has to be configured from your server’s control panel usually or you will need to contact your host provider. Look for rDNS or Reverse DNS or PTR Records or Network Settings in your Server Control Panel. z.y.w.x.in-addr.arpa domain name pointer mydomain.com. Don’t forget your to restart your DNS server if you have entered the records manually. Postfix is the backbone of this whole setup. Hence it must be installed and configured properly before going any further. # to make sure everything is up-to-date. Press Ctrl+D to send the mail. Now open your mail and check the Inbox or Junk/Spam folder to confirm that your test email has arrived. Login with the mail account you previously created. If you have reached this point without any errors, pat your self as you have completed 60% of the whole setup. Postfix allows us to send and receive emails using different email addresses on different domains using a single Linux user account. The emails received on the above email accounts will land in the inbox of contact user account. You can setup as many accounts as you wish by mapping them to the local Linux user accounts. But setting up too many accounts is not recommended. SPF records are used by most Email servers to prevent SPAM. If you don’t have these records chances are that all your sent emails will land in recipient’s junk/spam folder. @ TXT "v=spf1 mx a ip4:w.x.y.z"
Once all the above steps are completed, its time to test your newly born mail server. The MX, SPF and DKIM records must be present in the results. To make sure your email server meets the standards and follows the best practices, send an empty email to test@allaboutspam.com from your SquirrelMail. Open http://www.allaboutspam.com/email-server-test-report/index.php in your browser and enter the email from which you sent the empty email (contact@mydomain.com) and press enter. Within 10 to 15 minutes, a mail will arrive in your SquirrelMail inbox containing a link ensuring your email server is using the best practices. 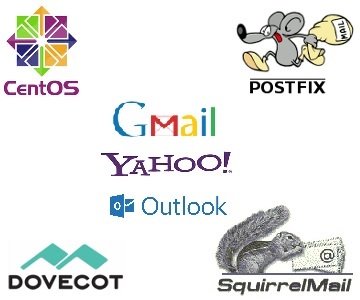 Try sending email from your SquirrelMail to the most used email services to test email delivery. Do not enter words like “test email” “mail testing” in the subject field or email body. Doing this increases the chances of your emails landing in SPAM folder. Enter something creative that doesn’t look like SPAM and your emails will land safely in Gmail’s and Yahoo!’s inbox! However in case of Hotmail this isn’t true. Hotmail’s SmartFilter uses IP reputation in addition to other methods to identify potential SPAM. It takes take for SmartFilter before it whitelist your IP. Until then your associates will have to check their Junk folder to find your email. Other than that, it works fine with most email services providers worldwide. In case you are having problems following this tutorial, just write in comments and we will sort out the problem! This entry was posted	on Monday, August 10th, 2015 at 1:05 am	and is filed under CentOS, General, ISP, Linux, Tutorials. You can follow any responses to this entry through the RSS 2.0 feed. You can leave a response, or trackback from your own site. Powered by WordPress v 4.1.26. Page in 0.148 seconds.